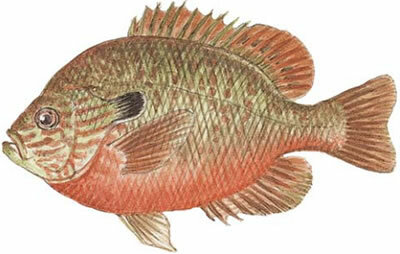 Similar in size and general appearance to the pumpkinseed and a member of the Centrarchidae family of sunﬁsh, the longear sunfish is a small, excellent gameﬁsh on light tackle, although in many places it is generally too small to be avidly sought. The white and sweet ﬂesh is excellent to eat. With a stout body, the longear sunfish is not as compressed as the bluegill or the pumpkinseed, its close relatives. It is one of the most colorful sunfish, particularly the breeding male, which is dark red above and bright orange below, marbled, and spotted with blue. The longear generally has red eyes, orange to red median ﬁns, and a blue-black pelvic fin. There are wavy blue lines on the cheeks and the opercles, and the long, ﬂexible, black ear ﬂaps are generally edged with a light blue, white, or orange line. The longear sunﬁsh has short and rounded pectoral fins, which usually do not reach past the eyes when they are bent forward. It has a fairly large mouth, and the upper jaw extends under each eye pupil. The longear sunﬁsh may grow to 9.5 inches, averaging 3 to 4 inches and just a few ounces. The all-tackle world record is a 1-pound, 12-ounce ﬁsh, taken in New Mexico in 1985. Spawning takes place from late May to mid-August, when water temperatures range in the upper 70s and lower 80s Fahrenheit, with longear sunﬁsh that are at least 1 to 2 years old moving to gravel bottoms. Males build shallow, saucer-shaped nests in water 8 inches to 2 feet in depth, guarding the eggs until they hatch about a week after being deposited. Many nests are usually found close together. Longear sunﬁsh feed primarily on aquatic insects but also on worms, crayﬁsh, and ﬁsh eggs off the bottom. Similar in range to the green sunﬁsh, the longear sunﬁsh occurs in east-central North America, west of the Appalachian Mountains from southern Quebec and western New York throughout the Mississippi Valley, and westward through Minnesota and Nebraska and south into Texas, as well as along Gulf Coast drainages to western Florida. This species inhabits rocky and sandy pools of headwaters, creeks, and small to medium rivers, as well as ponds, bays, lakes, and reservoirs; it is usually found near vegetation and is generally absent from downstream and lowland waters. 0 Response to "Longear Sunfish (Lepomis megalotis)"